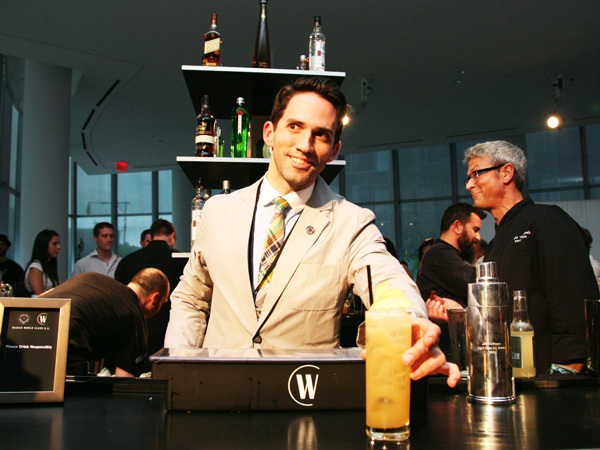 After a full day of cocktail competition judged by star mixologists like Food & Wine contributing editor Jim Meehan, Portland, Oregon, bartender Ricky Gomez triumphed over 20 other skilled competitors in New York this week to win the title of Diageo World Class U.S. Ambassador (Diageo is a beverage company). Born and raised in New Orleans, Gomez learned his craft from some of the country’s best mixologists at NOLA's Cure but more recently earned his reputation in Portland at Teardrop Lounge and Riffle NW. Through a series of challenges, Gomez secured the lead by upgrading a classic mai tai, pairing chocolate with a rum flip, creating an Asian-inspired tequila and tonic from a mystery box of ingredients and paying homage to Mark Twain with Scotch and oysters. He will go on to represent America during international finals this July in Brazil, where someone will be crowned World Class Bartender of the Year 2012. Here, Gomez shares what it takes to be a great American bartender and reveals the recipe for his winning drink. As an American bartender, what sort of edge will you have in Brazil? There’s one portion in Brazil that I’m looking forward to, which is the speed round. I think American cocktail culture differs from other cultures in that we try to do volume. Speed is a big part to what we do. There’s a lot of amazing presentation in Japan with carving ice balls, and it’s very romantic, and I love it. But I think American bartending is about atmosphere and excitement. Why are American bars exciting? There’s a tone when you go to a bar, and it's wanting to be entertained and have a full five sense experience. So I would really want to bring my American side to Brazil: entertain and interact and have my personality come through not only in my speaking and in my presentation but also through my cocktails. You can look at cocktails sometimes and tell who invented them just by the specific style or ingredient, and that’s what I like to see when I got into bars. What's next? The big thing that I am looking for is a music venue that does cocktails. I love going to bars and listening to good music—but I want to have a good drink too. That’s where drinking culture started, listening to music. I’m hoping someone will do that soon or, if not, that I’ll have the opportunity to create a space like that. 1. Add all ingredients to a cocktail shaker filled with ice. 2. Shake vigorously and strain into a rocks glass filled with crushed ice. 3. Garnish with a lime shell and mint.